Above : One of a small number of patriotik boneheads at the rally. Fascist groupuscule the United Patriots Front organised an anti-Muslim rally in Bendigo yesterday which attracted approximately 2-300 supporters, a large crowd of onlookers, and a rally in opposition of approximately the same size (if somewhat smaller). In both cases, many attending were from outside Bendigo. • A ‘global’ rally against Islam has been slated for October 10. 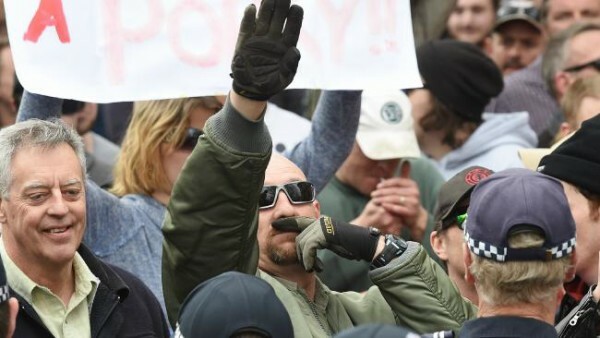 Originally touted as involving anti-Muslim activists attending their local mosques, currently the main goal appears to be to assemble in Canberra. Minor clashes at Mosque protest in Bendigo, skyNEWS, August 29, 2015 | Fights break out at Bendigo mosque protest, SBS (AAP), August 29, 2015 | Bendigo mosque protest: Anti-mosque and anti-racism protesters clash, Tom Cowie, The Age, August 29, 2015 | Mosque controversy drives rival protest groups to rally in Bendigo, ABC, August 29, 2015 | Australia: Anti-Racists Confront Anti-Islam Protest, TeleSur, August 29, 2015. See also : #UnitedPatriotsFront ~versus~ Bendigo Mosque (cont. ), August 23, 2015. This entry was posted in Anti-fascism, State / Politics, That's Capitalism!, War on Terror and tagged Australian Defence League, Bendigo, Blair Cottrell, Chris Shortis, Islam, Islamophobia, Neil Erikson, Ralph Cerminara, Rights For Bendigo Residents, Scott Moerland, Stop the Mosque in Bendigo, United Patriots Front. Bookmark the permalink. Although the UPF pulled decent numbers, one wonders if they’ll EVER be able to leave the house without five coppers each to hold their hands? The cost of VicPol babysitting operations seems to be rising exponentially in concert with the linear expansion of the group itself. At this rate, by the time the UPF pull five hundred to a single rally, the operation will bankrupt the force overnight and in the vacuum created by a lack of state violence, anarchists can seize the capital while the UPF spitroast pigs or crack rocks or each other in some wasteground outside of a medium-sized regional tourist centre. Or maybe that won’t happen. Curious about half-strength capsicum-spray claim. Is there two different brands? Whats the full story on that?